2 chairs / box. Floor to Seat Height: 48 cm. The upholstery fabric feels and looks like nicely worn leather. Seat Pad Thickness: 4 cm. Contemporary style Padded seat and back rest for comfort Durable and sturdy Easy to clean Suitable as occasional chair or everyday use Dimensions (W x D x H): 60 x 60 x 79cm . Set of 4 Solid Beach Dining / Kitchen Chairs, Chrome Legs, 34" Tall, £160, Used. 4 Sturdy Kitchen / Dining Chairs. Solid Beach Seating & Back. 34" From Floor to Top of Chair. 17" From Floor to Seat. Beautiful Greenwich dining chair. Bedroom Living Room Beds Dining Room Any Room. Stitched detail for a modern & stylish look. Assembly must not have been started. 23-10-2017 12:33:12. Cantilever chair is all about ease and comfort. Feeling down-to-earth sitting in one whilst enjoy a wonderful bounce. Looks like real leather but adds the benefits of a synthetic material, making these chairs hard wearing and easy to clean. 2 chairs / box. Floor to Seat Height: 48 cm. The upholstery fabric feels and looks like nicely worn leather. Easy assembly required. Seat Pad Thickness: 4 cm. Floor to Seat Height: 48 cm. The upholstery fabric feels and looks like nicely worn leather. Easy assembly required. Table is not for sale. Milan High Back Chair, Faux Leather (x2). Choice of Colours. Free Mainland P&P. The narrow, sleek rockers keep the chair firmly in one place. The chair is a perfect match for a dining table, a dining room, a kitchen, a study or a conference room. Type: Dining Chair. Elegant White Faux Leather Chair. 4 Kitchen Dining Chairs Chrome Legs Leather. Excellent condition! Style Diner Chairs In Turquoise. With Turquoise and White, Washable, Fire Retardant, Seats & Backs. Seat Height = 48cm. (But Four Are Available If Required). You are buying Two ! With Black, Washable, Fire Retardant, Seats & Backs. Seat Height = 50cm. You are buying FOUR Chairs. Style Diner Chairs In Red. With Red and White, Washable, Fire Retardant, Seats & Backs. Seat Height = 48cm. You are buying Two chairs. B-71 cm T 84cm H 82cm H seat 46 cm B-71 cm T 84cm H 82cm H seat 46 cm. L 200cm T 98cm H 84cm H seat 48 cm L 200cm T 98cm H 84cm H seat 48 cm. L 200cm D 89cm H 74cm H seat 47 cm L 200cm D 89cm H 74cm H seat 47 cm. D-CO 26 - black D-CO 26 - blue. D-CO 26 - turquoise D-CO 26 - yellow. D-CO 26 - dusty rose D-CO 26 - off white. D-CO 26 - Red D-CO 26 - Ruby. In addition, a white piping on the seat and back. Color: yellow Color: black. Cushioned cream faux leather seat. Ergonmically padded. Grab yourself a bargain RRP £69.99 each. Fixed at dining height. Seat shell with polished walnut finish. Cream padded faux leather seat. Contemporary chair. Grab yourself a bargain - RRP £55.00 each. Bentwood seat shell with walnut finish. Stylish black faux leather seat. Modern design. Super elegant and contemporary design dining chairs. Color: Black; Quantity: 2pcs. Super elegant and contemporary design dining chairs. 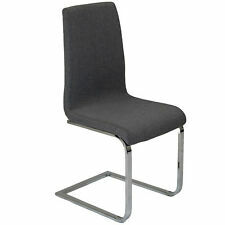 Chair Size: 42 cm x 46 cm x 101 cm/16.5 x 18.1 x 39.8" (L x W x H). Good quality faux leather seat. Max Load: 300 lb. Anti scratch pads to help protect flooring. A comfortable strong and stylish chair at an affordable price. Colour : White. We will do our best to turn any less than satisfactory experience into a positive one. - Seat: H45cm. - Curved Seat. Available in five vibrant colours. Baby & Child. Shower Panels. MY SIT Office Swivel Stool with backrest - Hazel in White/Brown. Baby Carriers. Our chair collections are all padded without exception so that you can enjoy a comfortable seating. These are super elegant and contemporary design dining chairs from Popamazing. It has a high density foam padding to provide you superior comfort. COMFORTABLE: The backrest and pad are full filled with density foam make you relex. This dining chair set with its sleek, modern design, will suit any kitchen or dining room. Assembly is very easy. Colour: Brown. Item as described. Are you satisfied?. Excluded areas: Channel Islands, Isle of Man, Isles of Scilly, Scottish Highlands and Scottish Islands.